Japanese curtain "noren", handpainted in both sides: fireworks, hanabi, for doors, corridors and to delimit spaces. A typical japanese curtain called noren, very suitable in little spaces to replace doors, good as well for windows or corridors. For huge spaces and lofts, it becomes a sofisticated space delimiter in home decoration. 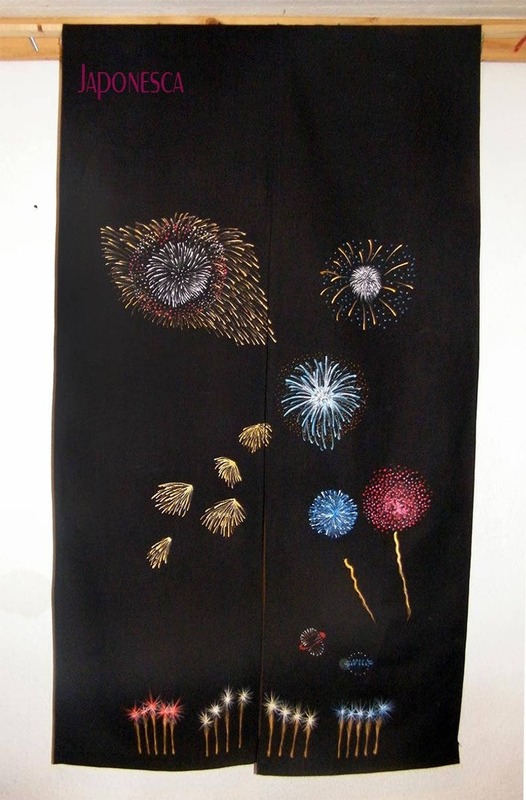 It has a very typical motif in oriental culture, that is the wonderful japanese fireworks, called "hanabi", handpainted on black thick linen. Painting is in glitter materials, so it brights when light touches it. Materials to fix it to the door's frame, the roof or the wall are included (curtains' cable and special nails). Envoltorio de estilo japonés para telas, y un original "Toblerone" para los pergaminos. Japanese curtain "noren", handpainted in both sides: bamboo, for doors, corridors and to delimit spaces. Japanese noren in cotton, curtain for doors and corridors, special for gentlemen. Samurai and japanese writing for man from Hokusai. 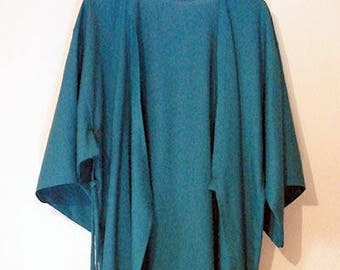 Japanese jacket, haori, in black silk. Stamped with typical japanese crest . Your name translated into japanese in a file reafy for tattoos or printing. Japanese calligraphy framed parchment zen style for decorating. Beige yukata unisex made in cotton, Japanese kimono for everyday use. Stamped by hand in the Japanese style. Amazing! Outstanding! Great work and we may order more!! extremely quick. beautiyfull graphic, nice Support. Me encanta, muy bonito. Era un regalo y le ha gustado mucho. Buen detalle la descripción del simbolo y el significado del nombre. Gracias!